1 A None No Power Seat 1 A is in the first row of the aircraft and is designated as an "Excellent" seat with extra legroom. This seat is also a "Duo Seat" which offers extra space due to the blocking out of the middle seat. This seat may have extra legroom however, the proximity to the lavatory and galley may be bothersome. 1 C None No Power Seat 1 C is in the first row of the aircraft and is designated as an "Excellent" seat with extra legroom. This seat is also a "Duo Seat" which offers extra space due to the blocking out of the middle seat. This seat may have extra legroom however, the proximity to the lavatory and galley may be bothersome. 1 D None No Power Seat 1 D is in the first row of the aircraft and is designated as an "Excellent" seat with extra legroom. This seat is also a "Duo Seat" which offers extra space due to the blocking out of the middle seat. This seat may have extra legroom however, the proximity to the lavatory and galley may be bothersome. 1 F None No Power Seat 1 F is in the first row of the aircraft and is designated as an "Excellent" seat with extra legroom. This seat is also a "Duo Seat" which offers extra space due to the blocking out of the middle seat. This seat may have extra legroom however, the proximity to the lavatory and galley may be bothersome. 12 A None No Power Seat 12 A is an "XL Seat" which offers extra legroom due to the exit in front but limited recline due to the exit row behind. 12 B None No Power Seat 12 B is an "XL Seat" which offers extra legroom due to the exit in front but limited recline due to the exit row behind. 12 C None No Power Seat 12 C is an "XL Seat" which offers extra legroom due to the exit in front but limited recline due to the exit row behind. 12 D None No Power Seat 12 D is an "XL Seat" which offers extra legroom due to the exit in front but limited recline due to the exit row behind. 12 E None No Power Seat 12 E is an "XL Seat" which offers extra legroom due to the exit in front but limited recline due to the exit row behind. 12 F None No Power Seat 12 F is an "XL Seat" which offers extra legroom due to the exit in front but limited recline due to the exit row behind. 14 A None No Power Seat 14 A is an "XL Seat" which offers extra legroom due to the exit row in front. 14 B None No Power Seat 14 B is an "XL Seat" which offers extra legroom due to the exit row in front. 14 C None No Power Seat 14 C is an "XL Seat" which offers extra legroom due to the exit row in front. 14 D None No Power Seat 14 D is an "XL Seat" which offers extra legroom due to the exit row in front. 14 E None No Power Seat 14 E is an "XL Seat" which offers extra legroom due to the exit row in front. 14 F None No Power Seat 14 F is an "XL Seat" which offers extra legroom due to the exit row in front. 2 A None No Power Seat 2 A is a "Duo Seat" which offers extra space due to the blocking out of the middle seat. 2 C None No Power Seat 2 C is a "Duo Seat" which offers extra space due to the blocking out of the middle seat. 2 D None No Power Seat 2 D is a "Duo Seat" which offers extra space due to the blocking out of the middle seat. 2 F None No Power Seat 2 F is a "Duo Seat" which offers extra space due to the blocking out of the middle seat. 3 A None No Power Seat 3 A is a "Duo Seat" which offers extra space due to the blocking out of the middle seat. 3 C None No Power Seat 3 C is a "Duo Seat" which offers extra space due to the blocking out of the middle seat. 3 D None No Power Seat 3 D is a "Duo Seat" which offers extra space due to the blocking out of the middle seat. 3 F None No Power Seat 3 F is a "Duo Seat" which offers extra space due to the blocking out of the middle seat. 30 C None No Power Seat 30 C is a standard Economy Class seat however, the proximity to the lavatories and galley may be bothersome. 30 D None No Power Seat 30 D is a standard Economy Class seat however, the proximity to the lavatories and galley may be bothersome. 31 A None No Power Seat 31 A is a standard Economy Class seat that has limited recline and is missing a window. The proximity to the lavatories and galley may be bothersome. 31 B None No Power Seat 31 B is a standard Economy Class seat that has limited recline. The proximity to the lavatories and galley may be bothersome. 31 C None No Power Seat 31 C is a standard Economy Class seat that has limited recline. The proximity to the lavatories and galley may be bothersome. 31 D None No Power Seat 31 D is a standard Economy Class seat that has limited recline. The proximity to the lavatories and galley may be bothersome. 31 E None No Power Seat 31 E is a standard Economy Class seat that has limited recline. The proximity to the lavatories and galley may be bothersome. 31 F None No Power Seat 31 F is a standard Economy Class seat that has limited recline and is missing a window. The proximity to the lavatories and galley may be bothersome. Vueling's Airbus A320 seats 180 passengers in a single Economy class configuration. However, Vueling does offer seats that feature added comfort for those who are willing to pay a little extra. XL Seats in the Exit Rows (12 and 14) provide passengers with extra legroom and are available for an additional 10 euros. Duo Seats are featured in the first three rows of this aircraft, where the middle seat is left empty allowing extra space for the passengers seated in the window or aisle seats; Duo Seats cost an extra 30 euros to reserve. Seats in the first row of the plane are Excellence seats and can only be reserved with Excellence Fare. These seats are Duo seats, but have greater legroom. Optimum Seats, located behind the Duo Seats, allow for a quicker exit but come at a cost of an extra 4 euros on domestic flights and 5 euros on international flights. The ultimate slim seats are not bad for short distances, but I would say the limit is 1 or 1:30 hours, not more. The tight leg space prevents you from changing body posture. The led ceiling reading lamps are powerful, but they are not orientable, and dazzle other passengers. In most Vueling planes, row 1 is called Excellence. It has plenty of legroom. Rows from 2 to 4 are called "Priority", and are equipped with a socket. Rows from 5 to 10 enyoy an extra inch of legroom compared to those between 15 and 30 or 40 (depending on if you fly on an A320 or A321. Although I don'have the exact number of legroom inches, it makes a big difference. These rows are priced accordingly. Being 6ft9 I do not have too big illusions about comfort flying 2-3 hours within Europe. But this type of aircraft is a bottomless impudence considering the seat pitch. I was not even able to touch the seat surface with my buttocks. I can not remember any disclaimer in the Airline's Terms of Service, that normal Eco is not suitable for tall persons (which would be disciminating by the way). Luckyly one exitrow seat was free for me without extra charge (after negotiating with the crew). Also reference to Vueling being a budget Airline do not count. This was a 300+  Iberia flight only operated by Vueling. Any questions to Iberia customer service have been unanswered for almost 3 months now. Only measuring 1.70cm was shocked when my knees were touching the back of the seat in front and I was sitting upright. My head must have been 20 cms from the back the seat in front. 1 client refused to sit in his seat as he couldn't physically do it and he wasn't much bigger than me. I would say 70% of the seats on this flight had similaar legroom. No leg room. I'm 5ft11 and my knees where in the seat back... only saving grace is that these seats don't recline. This seat has extra legroom do to being in the exit row, but no storage is allowed under the seat and it has a short armrest along the exit door. This flight was an A320, not a 321. Seat config seems to match the 321. Smallest seat I've ever been in! Based on the info on SEATGURU i choose row 3 (extra space, blocked middle seat) but.. it was the same seat as the others on the 320 (apart from exit seats). I don't feel happy after paying extra for these seats, apparently only to be close to the front exit and priority boarding. I'm fairly sure that row 29A-C has a smaller seat pitch than other rows. If the passenger in front chooses to recline, then I won't be able to put my tray table down. I'm 1.8m tall and i travel extensively, but i don't think i have ever travelled in such cramped conditions. A320 - This is the last exit row seat on this aircraft, it had loads of legroom and the seat also reclined, the tray table was on the seat in front and not in the armrest like some aircraft that have exit seats. I had a meadurement tape and the distance from my seatback to the seat in front was 25 inches more ir less. From the back of the head area to the seat in front was 22 inches max. The slimmer seats doesn't seem to have done much for passenger legroom, even for someone of my height (approx 5'9"). However, with my legs stretched under the seat in-front, I was plenty comfortable for the 2.5 hour journey. The coat hook is a good feature, as you can also hook the provided rubbish bag, thus allowing you to stow the table and leave the seat. A small touch but convenient. Fligt from Barcelona to Zurich. Service was good for a low-cost carier (the prices for beverages are very good). The seats are not extremly confortable. But for a such a short flight it's alright. The legroom in this exit row is really great (I'm 6'4"/193cm tall and I could nearly stretch my legs). I would recommend the airline but only when booking the exit rows. The extra costs for an exit row seat are not that high and the extra legroom is really a must for a tall person (the normal seats are just too narrow). Vueling's Recaro seats are incredibly uncomfortable for anyone over 6' tall. If you are tall purchase the extra legroom row (Exit rows or Row 1). Otherwise when any reclines you'll suffer knee damage. This row cannot recline and is incredibly tight. 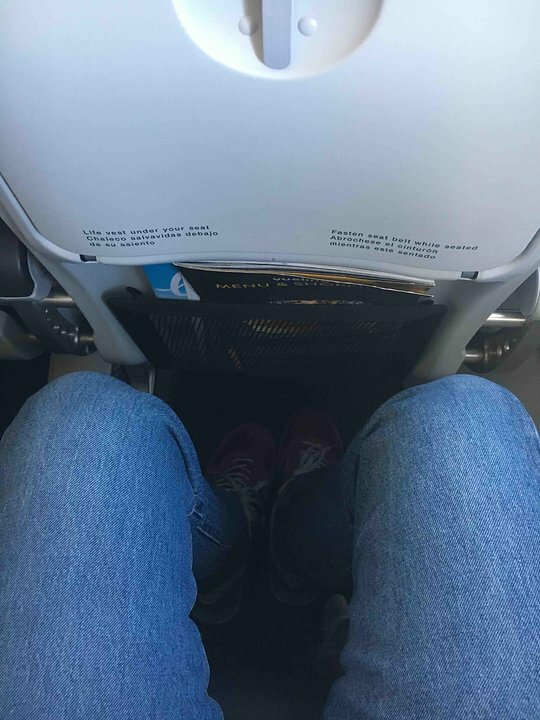 At 157cm I found my knees were nearly touching the seat in front. The tall guy next to me was struggling to get comfortable. Avoid this row. The entire Row 11 has been moved forward to make more room for the exit row. Do not sit in this row - there is barely enough room for a child - and once the row in front put their seats back it's even worse (row 11 cannot recline their seats). Flew the Vueling A320 MXP-AMS. The seat pitch is absolutely NOT 30 inches. I would say it's 28 inches. I flew Iberia Express's A320 a couple days after, which states that it has a 28 inch seat pitch for regular/cheap seats, and I certainly did not have any more knee room on Vueling than I did on the Iberia Express A320. I am tall at nearly 2 meters. Do not go into a Vueling a320 flight expecting 30 inches of seat pitch, because you will be sorely disappointed (no pun intended). Very comfortable seat, I am 184 cm tall and i had enough space for my legs. Maybe it's because of the plane, but with KLM and Transavia I didnt experience to be squeezed into the chair. I'm not that tall 187 cm, but it really hurt to have a normal/economy seat. 12A has extra leg room but it will cost you an additional 10 euros approximately. However this row does not recline because of the emergency row behind. Also, you're not permitted storage under seats or to place anything on your lap like a jacket or purse because this is an emergency exit row. You can't wear headphones during takeoff and landing for safety reasons. Seat pitch much too cramped. No room in overhead bins for my bag-and no room to put it with me or else there was no room for me! Never again on Vueling. I've flown Vueling a few times and generally I think they're okay for a low-cost carrier. However, I am suspicious about whether the 30" seat pitch is really accurate. I'm not tall, 5'9" (175cm), and my knees touch the back of the seat in front of me. I can't recall having this experience on any other airline, even other "low cost" airlines (though, admittedly, I don't fly low cost airlines very often). again Vueling shows how to be the worst airline with a seat configuration that makes my legs feel fully compressed! I'm 1.80mts tall and don't fit in the seat!!! The airline does not take too much into consideration the passangers comfortability. The seats need more space for legs. When there is a delay or cancelation there is never compensation as the law requires. Seville to Barcelona, very good airline, needs a little more legroom. I could fit my my knees in the seat and it was camfortable enough for a "low cost" airline, the flight was good. Vuelo LondonHR-Bilbao. Mido 1,88 m y no me entraban las rodillas pegando continuamente con el respaldo del asiento delantero. Lo hice saber a la tripulacion de cabina (muy agradables en todo momento) y me invitaron a pasar a la fila 2, con más espacio para las piernas. Space is really limited. I am 6´2 and I could not fit my knees behind the chair in front. There were empty seats in first rows and cabin tripulation looked for a seat in row 2. Plenty of space. Seat pictch supposedly 30", but space is really limited. I'm not particularly long with 5'9", but I could not fit my knees behind the chair in front. Fortunately the flight was not full, I could find an empty row allowing me to put my legs to the side. Vueling Airlines flies 1 versions of Airbus A320.